New York is the best setting for showcasing the season's greatest hits of the runway, right? Well, both Elle and Harper's Bazaar both believed so. 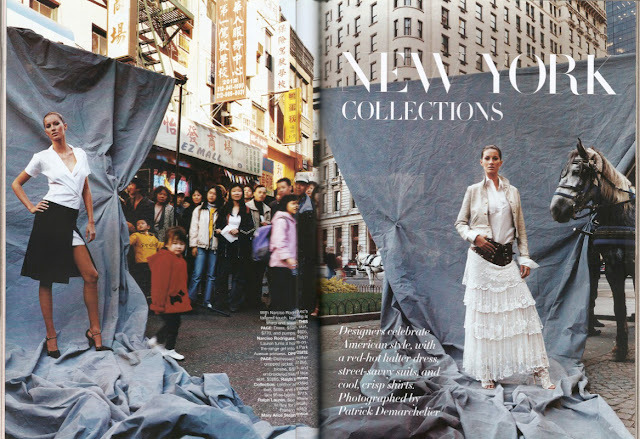 The 2002 January HB issue took a softer look at the collections and the city. Just 4 months after September 11, 2001 the editorial includes the people of NYC and an announcement where to send donations to the families of the fallen service men and women of that day. Oh yeah, and Giselle. In 2012 Elle said forget people! All we need are shoulders, eye shadow and two hunky dudes, obviously not real city workers. But the effect is not lost with either spread. Clothes this good can hold their own against the magnificent backdrop of New York City. 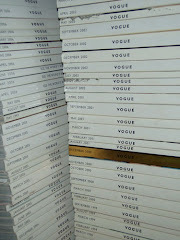 Labels: Elle, Harper's Bazaar, Magazine Archive, VS.